Mitigate fuel gas hazards with answers and expert support. The 2017 edition of the LP-Gas Code Handbook is your go-to source for correct NFPA 58 application. The Handbook helps you solidify your grasp of Code requirements to maximize safety and job performance. Clarify your understanding of NFPA 58 requirements through hundreds of full-color photos and illustrations -- including new graphics showing food truck applications, proper placement for LP-Gas container locations, and how NFPA 58 and NFPA 54 work together to help protect lives and property. Avoid potential incidents through Lessons Learned. Look to FAQs highlighting special areas of concern and answers to common questions about complying with NFPA 58. Expand your knowledge about the history and development of NFPA 58 and the evolution of the gas industry. Get details about preparing propane companies for natural disasters, cathodic protection for underground tanks, home fires involving grills, and other topics. Only the Handbook includes the complete updated text of NFPA 58: LP-Gas Code. Authoritative commentary written by LP-Gas experts explains the intent behind provisions. All-new commentary addresses LP-Gas fueled vehicles, hot air balloons, and other new coverage in NFPA 58. Shading on changes in the Code from the previous edition makes it easy to identify what's new. Interested in other editions of the NFPA 58 Handbook? Use the drop down menu above to select the edition year you need. Apply rules right and avoid accidents, delays, and fines. 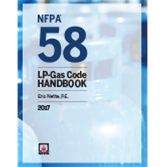 Update to the 2014 LP-Gas Code Handbook for reliable answers to NFPA 58 questions. Don't let confusion or uncertainty about Code provisions compromise propane safety. Gain the knowledge to mitigate hazards and avoid costly -- and possibly deadly -- mistakes with the total on-the-job support only available in the 2014 LP-Gas Code Handbook. This exclusive up-to-date industry resource has the extra information, advice, and visuals you need to back up your work on every project and prevent LP-Gas system failures, leaks, tampering, fires, and explosions. The complete text of the 2014 NFPA 58. Practical insights and application advice help you implement requirements and pass inspections the first time. Hundreds of full-color photos, illustrations, and graphics clarify concepts. Vertical rules on the outside margins make it easy to identify changes -- just like in the Code. FAQs highlight areas of concern based on input from the field. Valuable supplements add to your knowledge of important topics such as preparing propane companies for natural disasters, cathodic protection for underground tanks, and home fires involving grills.